Posted on Fri, Apr 6, 2012 : 4:25 p.m. 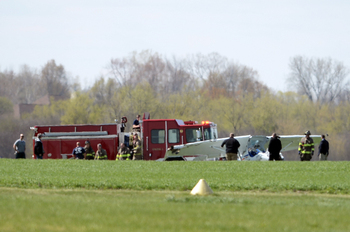 The investigation into what went wrong before Thursday’s plane crash at Ann Arbor Municipal Airport could take several weeks, according to a Federal Aviation Administration official. FAA spokeswoman Elizabeth Cory said a typical timeline for a crash like the one on Thursday is several weeks and investigators will examine everything from the plane’s construction to the pilot’s actions. Federal investigators will also check to see if all rules were followed, if the plane was properly maintained and licensed, and any other regulations that may apply, she said. A two-seat experimental airplane crashed shortly after take off at about 11:43 a.m. Thursday. The pilot had to be cut out of the plane after being trapped, according to Pittsfield Township Public Safety Director Matt Harshberger. The pilot was trapped in the plane for about 30 minutes, but was reportedly conscious and talking with emergency crews at the scene, Harshberger said. He was taken to the University of Michigan Hospital to be treated for his injuries, which were non-life threatening, said Huron Valley Ambulance spokeswoman Joyce Williams. Williams said the man was in serious but stable condition. Pittsfield Township public safety officials said Friday that they’ve turned over the investigation to the FAA. The plane was a fixed-wing, single-engine aircraft licensed by a company from Flat Rock. The pilot’s identity and condition was still unknown as of Friday afternoon. Fri, Apr 6, 2012 : 11:42 p.m.
Glad he survived and didn't go down in a residential area like the military aircraft in Virginia Beach. those pilots survived but civilians on the ground are still missing in the debri and fires. Mon, Apr 9, 2012 : 7:15 a.m. I won't deny having a healthy amount of paranoia. As it turns out, all are accounted for and no one was killed at Virginia Beach. Everybody got lucky this time. Sat, Apr 7, 2012 : 12:43 p.m. Sat, Apr 7, 2012 : 11:43 a.m.
That is not accurate. They are assuming people are missing until they complete a search of all buildings. No one has been reported missing as of last night. Sat, Apr 7, 2012 : 5:35 a.m. It's always sad when anybody dies, but I sense a little anti-military sentiment here. If you're concerned about the dangers of military aviation, you are free not to buy or lease near a military airfield. In one sixteen-month period in the 1980's, I saw my own squadron lose two helicopters and crews plus pax. In total, 19 officers that I knew personally in my own squadron and others got killed in helo crashes in that time; I stopped counting after that. It's a profoundly dangerous business done with the utmost regard to safety toward the civilian population, and you should be thankful that this country still produces men an women willing to do it for you.